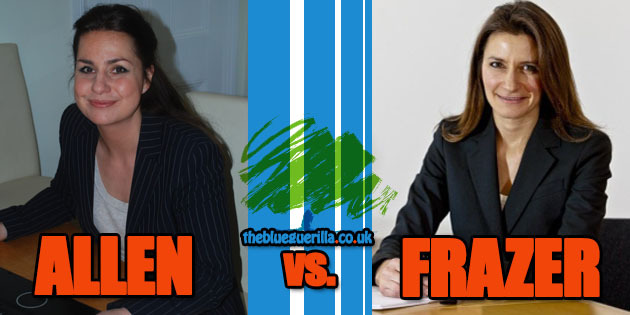 TheBlueGuerilla: Tories Opt For Frazer in Chaotic Cambs Selection Row. LUCY FRAZER has been reaffirmed as the official Conservative Party candidate for South-East Cambridgeshire at an emergency meeting of the association and CCHQ officials last night in Ely, TBG can reveal. Issues with the voting process and the count led to the abrupt emergency meeting after the Returning Officer took ballots home from the SE Cambs Tories' open primary to personally recount them and then sensationally alleged Frazer's opponent, Heidi Allen, actually had more votes. Sources at last night's meeting insist the decision to keep Mrs Frazer as their candidate was to "preserve party unity."